While still remaining active, we haven't had a studio album from Germany's Diabolos Dust since their 2013 album Inferno. Yet the band has been busy performing and sharing the stage with acts such as Paul Di'Anno, Dark Fortress, Sacred Steel, and Arven. 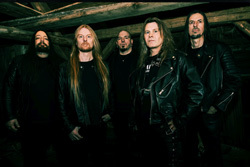 Their travels have taken them to some prominent metal festivals as well including Metalfest Austria and Bavarian Metalheadz Open Air. The quintet returns with their third album, The Reaper Returns through Massacre Records. As in the past, Diabolos Dust sticks with their tried and true sound, essentially traditional heavy metal with a fair dose of speed and thrash metal. Most every song has the tandem features of being both heavy and fast, where all things lead to fiery and frenetic guitar solos. Additionally and as expected, vocalist Peter Lohwasser continues to sound rough, raw, and caustic, nearly inches away from stumbling into death vocals. Frankly, with his voice, my interest in Diabolos Dust diminishes quite quickly. Sure, the band has the classic heavy/thrash metal vibe nailed to a tee, and the solos are terrific, but I'm hard pressed to enjoy Lohwasser's vocal presence. Otherwise, if I could pick songs for their heavy metal value alone, my top choices would be Roll You Dice, Fall Of The Gods, and Hold The Flame, though it's unnecessarily long. Basically, if you can ignore the harsh and disturbing vocals, you'll find that Diabolos Dust delivers more thrashy heavy metal with The Reaper Returns. 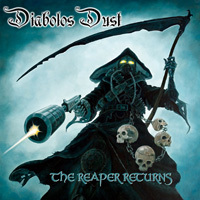 Basically, if you can ignore the harsh and disturbing vocals, you'll find that Diabolos Dust delivers more thrashy heavy metal with The Reaper Returns.